In this episode, you will learn about about building blocks of successful social media strategy, and the direct impact social media had Casa Larga Vineyards in 2016 from Camille Zess, consultant at Break the Ice Media. By the time Camille left college she was already an accomplished writer. As a writing minor, she took many classes in different types of writing including memoir, which involves real storytelling. And storytelling is key in marketing communications, advertising and public relations. She also trained intensively in grammar and in teaching the subject of writing where she learned to strengthen others’ writing while preserving their style. An early adopter in social media, she has long experienced using Facebook, Facebook advertising, Linkedin, and Twitter. As someone particular adept at working in the digital media space, Camille focused on social media when she first joined Break the Ice. She’s able to sense changes in social media as they begin and to view its future. This ability gives our clients the help and advantage they need in social media marketing. Now Camille uses her creative magic with words to write content for social media, websites, blogs, and advertising that Break the Ice provides for our clients. That isn’t all. She’s also able to act as a journalist or write a case study or capture the voice of brands we work with, and she produces high quality, creative online and email marketing campaigns for our clients. Thank you for joining me, Camille. Thanks for having me on, Nicole. Today’s teamcast will focus on social media strategy using one of Camille’s clients, Casa Larga Vineyards, as a case study. To start, Camille, can you tell us a little bit about Casa Larga Vineyards? Casa Larga Vineyards is a client that we’ve been working with for over seven years, now and they are an award-winning winery in Fairport, New York, just outside of Rochester. They started making wines in the ’70s and they established as a winery in 1974. We work with them to create and execute strategic marketing plans and their social media strategy, especially in 2016, was very successful and we did a case study on it. Like their full marketing strategy, it’s built around their business goals and key messages and we use Facebook, Twitter and Instagram. That’s really awesome. Casa Larga Vineyards is a winery, but they offer a lot of other things besides wine. Can you talk a little bit about the different business units that they have? Yes. They make wine. There’s the winery aspect, but they also have the wine shop, they have the events facility where people can host weddings and proms and corporate events and all sorts of special occasions, and they also have a wholesale component, so they’re in liquor stores and restaurants, and they go to festivals where they have tasting booths. That’s great. Can you tell us a little bit about some of the results that you saw in 2016? I think maybe we’ll talk a little bit about what you measured for the 2016 social media successes, and then we’ll back up and talk about how you get there. Okay, yeah. Facebook, first and foremost, is probably their biggest channel, definitely their biggest channel. It grew by 12% in 2016 and drove over 15,000 visitors to the website. For Twitter, we earned 144,700 impressions and were mentioned 256 times, which was great because that’s almost once per day. 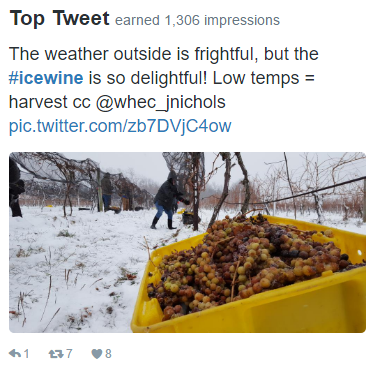 Instagram grew by 84%, it was in its second year of having that channel for the winery, and we averaged 26 Likes and 1.3 comments per post. That’s really fabulous. 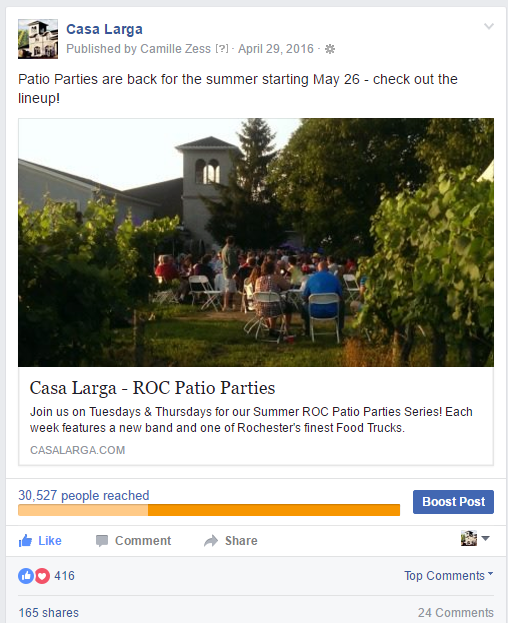 And I know that social media’s so important especially for Casa Larga, and in the wine industry- just being located in the Finger Lakes region, I know social media channels are relied on a lot to get the word out about what’s happening at the winery. I’m looking forward to learn more and for you to share with our listeners about just how you go about using social media for building business and for gaining traffic and attention, and so with that I know you’ve got some building blocks outlined, can you walk us through the strategy and how you do it? Right, yes. Well, the first step is to define goals. It’s the most basic thing, but you can’t measure anything if you don’t have goals, or it’s a lot harder to- and it’s the most important part of the strategy, in my opinion. The social media strategy should be the same as the marketing strategy and the same as the business strategy, you know the business goals. All the goals should really be the same because social media is one aspect of the business and all of the marketing supports the business goals. In our philosophy, that’s how we line things up and define them. 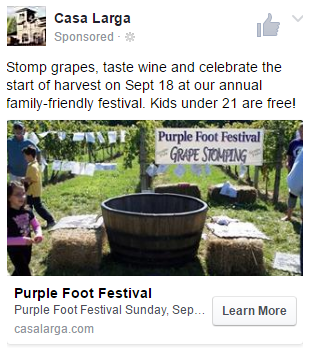 So for example, one of Casa Larga’s business goals is to have people visit the winery so they will buy things. On a business level, they have tours and tastings, they create events like festivals, they have summer parties by the vineyards, those are fun, and they attract people to the business, and then marketing and social media support that by promoting those messages and bringing people in. That’s great. What would be an example of a goal related to one of those business goals? A goal for social that’s related to one of those business goals? A goal for social would be encouraging people to visit the winery, the same as the business goal. So the goal is we want to bring people to the winery, what message can we put out that will attract them to come to these events? How frequently do I have to put it out there, what channels does it need to be on, you know, can we advertise it? Who is this talking to you? And those are all other components, other building blocks that we’ll talk about today. Great. So goals is the first building block. What would be another building block? The next building block is messaging. The message is the most strategic part of all the planning and posting, it has to do with what you’re talking about. 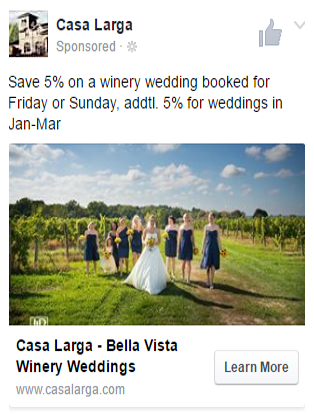 The winery has special events, seasonal promotions, year round things that they need to promote all the time like they’re always promoting weddings. That’s a message that I have to make sure that I’m strategically putting on their social media channels throughout the year. And then seasonally, when am I starting to talk about holiday gifts? When am I starting to talk about the summer patio parties? It’s the timing, and it’s the message. Where do the messages fit in, what are you promoting, and how are you supporting those promotions with the social media? Yeah, so I think that’s really interesting perspective because what you’re talking about is a lot of people think of social media as being in the moment, and in the now, and it’s authentic and it’s organic, and all those buzzwords that are used, but really there’s some thought and some strategy behind what you’re posting. Can you talk a little bit about the strategic posting but then also does it get balanced with organic messaging? Yeah, definitely, you want to share fun things too. One of the nice things about the winery is that a party at the winery is already a fun thing. It’s a little bit of sales, but it’s also fun, and people are interested in it. So I’m lucky in that they have something fun to promote and that’s why we love working in travel and tourism. Yeah, it does make it a lot of fun, right? Gives us a lot of great content. So when you’re putting together the messaging for Casa Larga, for example, how far out do you plan and what are some tools that listeners might use if they’re thinking about planning their own messaging around looking at, you know, seasonality or events and things like that? Right. We get together for marketing meetings every other week, so we are always on top of what’s current, what needs to be promoted. I also have just a running list, I’m making sure to promote events at the winery at least once a week on Facebook and Twitter. We want to be talking about if they’re at a liquor store doing a tasting, or if they’re out at a festival doing a tasting, that it is promoted on social media so people know that they can find them and it also promotes their wholesale arm of the business. And then anything going on in the wine shop, I need to be current on when the tickets are live and what the price is, we don’t want to mention that there’s too much rain or something like that. There’s not too much rain, they’re fine. You want to make sure you have the messaging in place, and a lot of times we take our messaging from a press release, because we start at the top with planning for a press release, and what’s going on the website, and then that filters down into what’s being posted on social media and in their weekly email blast. I keep very current with what the winery is planning, and we try to start promoting things early enough so that people will be interested and have time to plan around their schedules to come visit the winery. I think you just made a great point, as you were starting to describe where all these content pieces come from and how they flow together. You were talking about using a press release, email marketing, website content, and how all of those things kind of mirror each other, right? And there’s a consistency in messaging between all of those different channels. Absolutely, and that’s why I say it all goes back to the business goals. Right, so everything’s always tying up. Yeah. It makes it consistent when the business goals are lined up for the marketing goals and the social media goals. It helps to tie it all in together. That’s awesome. So we have two building blocks so far, we have the goals and the messaging. What is another building block for social media strategy? The next building block is frequent posting. You can also consider this timing of posting. A lot of people wonder, “how often should I be posting on social media?” and it’s really a tricky question. It’s definitely something that I try to keep on top of and I’ve Googled articles about it before, and I get a lot of big box channels like Nike and Coca-Cola and things where people say, “You should post on Facebook five times every day, and here’s ideas.” Smaller businesses and a lot of our travel and tourism destinations are smaller, and they don’t have millions of followers on Facebook or Twitter or Instagram. They don’t have the capacity to play with Facebook’s algorithm like that. Actually, the winery, if I post two times in a day within a few hours of each other, I notice that the second one gets significantly less reach, and that’s because Facebook’s algorithm is saying, “Slow down. This is too much, you don’t really have enough followers for that.” We do post daily because they do have a large following for their relatively big attraction, so they do support that and there’s enough content, and there’s enough things for me to talk about where I’m posting pretty much daily for them. So when it comes to how often should I post on Facebook? Look at how big you are in terms of followers, and it doesn’t hurt to try it out, try posting three to five times per week, and if you think that’s going well and you think you have enough content go to daily, if daily’s working try two times a day. Maybe that will work. It’s all about finding what works well, and looking at your analytics. Facebook and Twitter have analytics, and if you sign up for Instagram for Business there are analytics now, they’re definitely in the beginning stages, but they have them. On your Facebook page to find those insights you go up to, there’s an Insights tab when you’re on your page, and there’s a subsection on the left hand side called “Posts,” and by the time this airs maybe they’ll change that, I don’t know, they’re always changing things. On that Posts section it’ll show you in-depth data on how many people the post reached, how many Likes, how many link clicks, how many reactions, how many shares, and you actually might find that something that didn’t have a lot of reach may have actually reached a small number of people who were interested in it and clicked on it or shared it. Sometimes you’ll see a share show up in that back end insight that doesn’t show up when you’re just looking at your page because whoever shared it has a privacy setting where you wouldn’t see it from the front end, but you can see it from the back end. Those are really important numbers to go and get from the back end of Facebook and not just rely on what it says on the front for how many likes or reactions it has. Back to the frequency of posting, Twitter, post whenever you want, probably waking hours for your time zone, but you can post as many times per day as you like. For smaller businesses who are worried about time resources, I would say post at least three times every week, and if some weeks you have more things to talk about reach out to Twitter. The message on Twitter can usually be pretty similar to what you’re sharing on Facebook, but make sure that you’re including a couple of hashtags and cutting down to the correct amount of characters. Instagram, if you’re short on time, one post per week is completely fine. 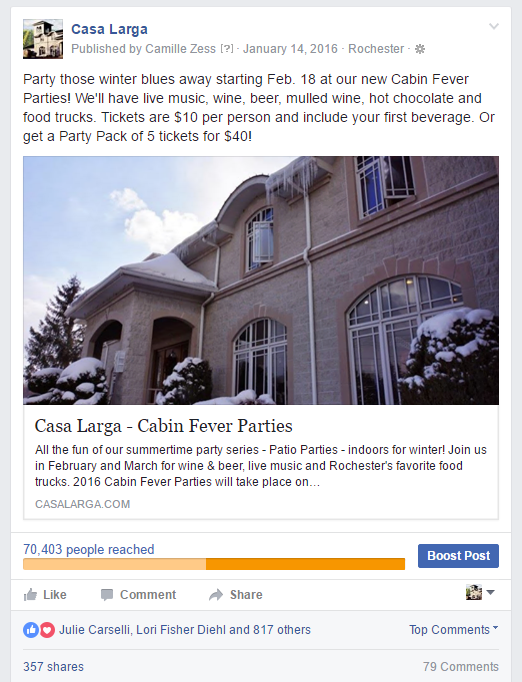 Actually, Casa Larga only had 43 posts in 2016, and we still saw that 84% growth on the Instagram channel. Using hashtags, use as many hashtags as you feel is appropriate and have fun with them because people are searching for the fun things on Instagram. With 43 posts you can tell that it was just under one per week, 52 would have been one per week. And Instagram posts, I wouldn’t connect Facebook and Twitter to each other, but sharing from Instagram to Twitter and Facebook goes over really well now, people like that, it makes you seem more authentic like, Nicole, you mentioned, you know you think social media’s supposed to be so right now and authentic, and it can and should be that, but when you’re looking strategically you want to think strategically but you still want your channel to look genuine and authentic. Yeah, and you know what, I’ve actually been wondering about that Instagram. It seems like it is acceptable practice to share from Instagram to Twitter and Facebook, but sharing from Facebook to Twitter, you know some of those other crossovers don’t really work as well, do they? No, they don’t, but I see it, not just with brands, but with my friends and my friends are posting from Instagram to Facebook, and I think that’s one of the key indicators that it’s okay to do that now. A lot of people are on Instagram, and a lot of people are on Facebook, and Facebook owns Instagram, and it translates well to Twitter. But Facebook and Twitter don’t really play very nicely together, I wouldn’t suggest cross posting. It’s easy enough whatever you’re writing in Facebook go and write it separately in Twitter, it takes two seconds. Right. Yeah, I would agree. Okay, so frequency of posting is the third building block, what’s the next building block that you have? Our next building block is audience. Who are we talking to? There’s a lot of great ways to approach it. When you write, you’re talking to a certain audience, and when you’re posting you’re talking to a certain audiences. In Casa Larga’s case, I’m thinking of who am I talking to for this particular message? For the most part, I’m talking to consumers over the age of 21, primarily in the Rochester area although they do have customers outside of Rochester because they can ship wines- to 38 states by the way. But when I want to talk about weddings at the winery or corporate events at the winery, am I still talking to those same consumers? Actually, yes, but I’m not talking to brides and grooms unless I’m sending a specialized email to brides and grooms or making a special Facebook ad that will only find engaged couples. If I’m posting about weddings at the winery maybe it’s their friend, parent or loved one who is really close to them and might say, “Hey, I saw that this winery in Rochester can host a wedding, this is a wedding venue, have you thought of that?” The wedding message still fits on their social media platform but with general language that just talks about, “Hey, did you know this is about winery weddings?” Or “Here’s some winery wedding inspiration.” I could be talking to anybody, future brides, mother of the bride, mother of the groom, father of the groom, whoever is paying attention, anybody could be in a wedding or helping somebody plan a wedding. The same thing goes for corporations, I know when you talk about business to business communications people always say, “Well, who is your customer?” They’re people, they’re still people. So, the business and the corporate messaging also works on the social media channel because they’re having fun on Facebook but they probably belong to a company. Right, exactly. So what you’re suggesting is just making sure that the tone and the choice of words that you use speak to a broader audience in that example. Yeah, in this example I’m keeping the audience in mind as a broad consumer and not a specific bride or a specific event planner. I’m talking to anybody who might be interested, and it seems to go over pretty well. That’s great. Now I know you have, I think, just one more building block that you wanted to share with us. And what would that one be? Yeah, that one is Facebook ads. The Facebook algorithm is mysterious and always changing and you can’t always rely on organic, meaning unpaid, posting alone to get your message out. Frequent messaging- when we did our Mother’s Day promotion this year we did a lot of posting just on that one event and it drove a lot of interest and they had a great event. That’s not always going to be the case, and so we advertise the summer parties because they’re very long ranging and they’re festivals, and we advertise different events going on throughout the year to give everything a little push. It doesn’t have to be a lot of money, I love Facebook ads because they’re so affordable and they can run on Instagram as well. So when you have your Instagram channel, it gives it a little push when you have and ad running on Instagram because people will be liking the ad which shows up as a post, and you’ll start seeing notifications come in that people liked it and you’ll see the clicks come through. Look at your messaging themes for the year to decide what needs an extra promotion- what could benefit from that. We used five main themes last year to structure the Facebook advertising. So the events and some classes that they held, weddings, they had a few wine dinners, their Purple Foot Festival, and then we encouraged post engagement for patio parties and things like that. So we got 753 event responses to the events, 15,223 post engagements and over 9,000 link clicks which is over 50% of the link clicks generated from Facebook for the entire year, and 548 page likes. You’ll notice that I didn’t have a page like campaign running but with all of those campaigns for the year, and we really didn’t spend very much, we got 548 new page likes from people who saw the ad, and that also was double what we got organically. So without advertising, we would’ve grown by only about 500-page likes, and now the page grew twice as much. What do you think a typical advertising budget should be on Facebook? And I’m sure it depends on how many campaigns you want to run and for how long, but for listeners’ sake, what should they be thinking about when they’re thinking about an ad buy on Facebook, for a budget? Oh, yeah, that’s tricky. Facebook, when you’re running a campaign, depending on your objectives that you define when you start a campaign, is either one dollar per day minimum or five dollars per day minimum. So that gives you an idea of what you’re going to need to spend. And I like the idea of the five dollar per day minimum when I go into the budget, if I really just want to do the minimum on some page engagement I set the timeline, like is it this month, is it the next couple weeks, and I look at, Facebook will tell you if you type in a number that’s too low, so sometimes I’ll even type in ten dollars for a month even though I know that’s not the rules just so it’ll tell me what the minimum is. And it’ll get red and it’ll say, “You can’t do that. You have to spend at least fifty dollars or forty-nine dollars, and then I know where my parameters are, and I can either go a little above that, we can just do the minimum. That’s great advice, and I know we dug into Facebook advertising on a previous podcast with you, so we’ll make sure that in the show notes we link to more information on Facebook advertising. What I really like about this building block is that, for brands and companies, you can’t just rely on the organic anymore when it comes to Facebook, but a little bit of money can actually really go a long way in terms of getting exposure on that particular channel. And I think that’s just a really important point to take away from this conversation. Yeah, that’s definitely an important part of the overall strategy is to find some marketing dollars to put into Facebook ads. Camille, this has been a really great conversation and I’ve enjoyed hearing you talk about social media and how you use it with Casa Larga Vineyards, the building blocks, goals, messaging, frequency of posting, audience, and then the Facebook advertising. Do you have any final thoughts that you’d like to share with our listeners before we sign off for today? I would just like to summarize and say make sure that you’re lining up your social media messaging and your strategy around what you want to accomplish for your business. I know it sounds like something simple but it might, when you go in an evaluate, it might not be something that you’re doing 100% of the time. And that is really terrific advice. Camille, I thank you for taking some time out and being on our teamcast episode, and we’ll look forward to having you on again. Thanks. I’ll see you later.